First real snowfall of the year. Not much accumulation on the grass, nothing on the roads really, but I will probably have to dust off the windshield before going to a lunchtime meetup (congrats to the Bride to Be, one of my favorite costumers and bagel customers, affreca). I'm making headway with the dishes, have a mountain of laundry threatening an avalanche, and will have two hungry children soon. If I can delay them for just a little longer, I can do brunch for them before I leave, and not have to worry about lunch while I'm out for them. I should also bring the skull applique template to costume meetup, it's either going to be part of a quilt square or part of a pirate themed kimono. Yes, it should be a good follow up to the Cowmono. 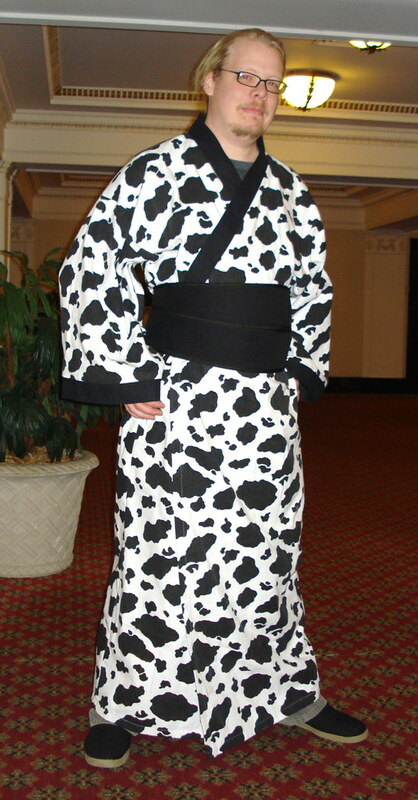 At some point I'll do black hakama and a cow print jacket, and it'll be Samurai Moo. I'm tempted to put a modified Mooby's logo on it.